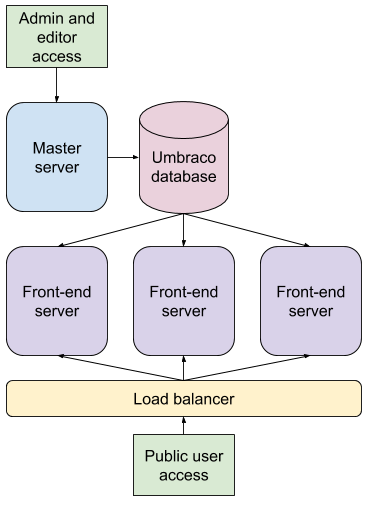 Information on how to deploy Umbraco in a flexible Load Balanced scenario and other details to consider when setting up Umbraco for load balancing. Traditional load balancing must be used for Umbraco versions less than 7.3.0. Be sure you read the Overview before you begin! You will designate a single server to be the backoffice server for which your editors will log into for editing content. Umbraco will not work correctly if the backoffice is behind the load balancer. For options #2 and #3 you will obviously need a load balancer to do your load balancing! In order to understand how to host your site it is best to understand how Umbraco's flexible load balancing works. There can be up to a 5 second delay between content updates and a front-end server's refreshing, this is expected and normal behaviour. Flexible Load Balancing will automatically elect a "Scheduling server" to perform the above services. This means that all of the servers will need to be able to resolve the URL of either: itself, the Master server, the internal load balancer or the public address. For example, In the following diagram the slave node f02.mysite.local is the elected "Scheduling server". In order for scheduling to work it needs to be able to send requests to itself, the Master server, the internal load balancer or the public address. The address used by the "Scheduling server" is called the "umbracoApplicationUrl". By default, Umbraco will set the "umbracoApplicationUrl" to the address made by the first accepted request when the AppDomain starts. It is assumed that this address will be a DNS address that the server can resolve. For example, if a public request reached the load balancer on "www.mysite.com", the load balancer may send the request on to the servers with the original address: "www.mysite.com" so by default the "umbracoApplicationUrl" will be "www.mysite.com". 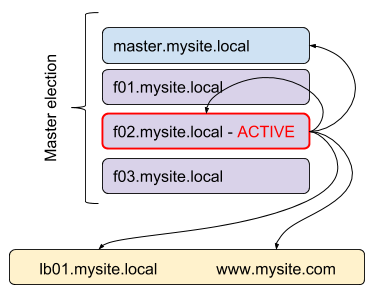 However, load balancers may route the request internally under a different DNS name such as "f02.mysite.local" which by default would mean the "umbracoApplicationUrl" is "f02.mysite.local". In any case the elected "Scheduling server" must be able to resolve this address. There isn't any Umbraco configuration file changes necessary. You must not enable the distributed calls flag in the umbracoSettings.config file for Flexible Load Balancing to work, that is purely for Traditional load balancing. We have focused primarily on Azure Web Apps when developing flexible load balancing for cloud based appliances. The documentation here is for Azure Web Apps but a similar setup would be achievable on other services supporting ASP.NET. Ensure you read the overview before you begin - you will need to ensure that your ASP.NET & logging configurations are correct. The SyncTempEnvDirectoryFactory enables Examine to sync indexes between the remote file system and the local environment temporary storage directory, the indexes will be accessed from the temporary storage directory. This setting is needed because Lucene has issues when working from a remote file share so the files need to be read/accessed locally. Any time the index is updated, this setting will ensure that both the locally created indexes and the normal indexes are written to. This will ensure that when the app is restarted or the local environment temp files are cleared out that the index files can be restored from the centrally stored index files. In ExamineSettings.config, you can add these properties to all of your indexers and searchers: useTempStorage="Sync" tempStorageDirectory="UmbracoExamine.LocalStorage.AzureLocalStorageDirectory, UmbracoExamine"
The 'Sync' setting will store your indexes in the local workers file system instead of Azure Web Apps' remote file system. Lucene has issues when working from a remote file share so the files need to be read/accessed locally. Anytime the index is updated, this setting will ensure that both the locally created indexes and the normal indexes are written to. This will ensure that when the app is restarted or the local temp files are cleared out that the index files can be restored from the centrally stored index files. If you see issues with this syncing process (in your logs), you can also change this value to be 'LocalOnly' which will only persist the index files to the local file system but this does mean they will be rebuilt when the website is migrated between Azure workers. Important! Your Examine path settings need to be updated! Azure Web Apps uses a shared file system which means that if you increase your front-end environment scale setting to more than one worker your Lucene index files will be shared by more than one process. This will not work! The TempEnvDirectoryFactory allows Examine to store indexes directly in the environment temporary storage directory, and should be used instead of SyncTempEnvDirectoryFactory mentioned above. Do not scale your master/administration environment this is not supported and can cause issues. Azure Web Apps can be manually or automatically scaled up or down and is supported by Umbraco's flexible load balancing. Important note: This also means that you should not be editing templates or views on a live server as master and front-end environments do not share the same file server. Changes should be made in a staging environment and then pushed to live environments. If you are not using a cloud based setup then this is the recommended setup. Scaling will still be a slightly manual process because it would involve you adding servers/sites but with flexible load balancing you don't have to configure anything in Umbraco, you just need to point the site to the Umbraco database and update your load balancer to include the site. Configuring your servers to work using a centrally located file system that is shared for all of your IIS instances can be tricky and can take a while to setup correctly. Once you are familiar with how flexible load balancing works, you might be interested in some advanced techniques.